It’s almost Christmas, and you know what that means. Well yes, there are festive family get-togethers, spiritual rejoicing and gift exchanges. But I’m talking about that thing that comes right after Christmas. That’s right, taking down all of the lights you hung outside. Oh the joys of dragging out a ladder, and unhooking strand after strand of lights. At least when you’re hanging them, you can stand back and admire your work. After taking them down, all you get to see is the pile of cords you have to somehow wind up in an orderly fashion. If you’ve got some cash to burn and are tired of dealing with the hassle of hanging Christmas lights, you might want to take a gander at the LiteLocker. 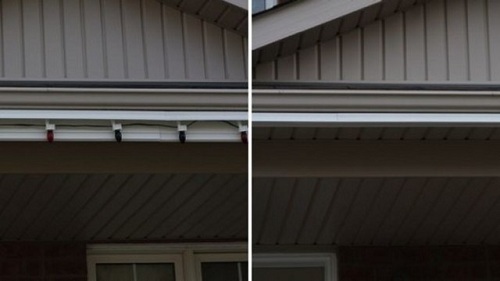 It’s a system that hangs below your guttering (or anywhere, really) and houses a strand of lights. When it comes time to light up the house, you just open up the LightLocker boxes (broken into 4-foot pieces to accommodate most areas of your house) using a special tool. You don’t even have to climb a ladder, the tool reaches up and opens them. Closing it is just as simple. Your neighbors will never know that you only spend a few minutes decorating your house each winter. Heck, you can order some of these and wait until it’s nice and warm outside to install them. A 24-foot set is going to run $70. * No more dented and marked eaves troughs. * No more twisted and tangled lights. * No more drooping strings from broken clips. * No more Christmas lights in the summer time. * Packaged in 4 foot length for the DIY homeowner. * Opens and closes in minutes to display or store lights. * Easily installs with simple tools.